Art = Life at R.L. Delight Fine Art: 30 in 30 Challenge: Day 30-At the Finish! There is always a lot of wave action on the north end of the beach at the foot of Neahkahnie mountain but sometimes there is more than others. The splash wave in the upper left corner only happened once. Usually with waves there is a cycle where patterns repeat for a limited time as the tides come in and out. The cross waves are a good example. There is about an hour window when they happen in cycles. Not every time a wave comes in, just within a cycle. Hope that makes sense. This little splash wave was a cross between a backwash wave and a zipper wave. Both are my terms for what I see so apologies for any confusion. The backwash and a cross wave hit an incoming wave in the trough between the near swell and the breaker wave. Are you still with me? What all this is leading to is that I only had that one opportunity that day to observe and try to capture that little splash wave. As you can see, I went for it. So, here we are at the end of the challenge! It seemed like this day came with agonizing slowness. So here is what I have learned, so far, as I am still processing what I have learned. I am not a "daily painter". For those that don't know, daily painters usually produce a small finished painting a day. I paint daily but I don't always want to produce a small painting a day. I also want to produce larger and more complex paintings. I am beginning to understand the discipline and energy that I need to put into my work. That is a really good thing because it excites me and I feel like yes, I am up for it. I know now that I am capable of increasing my production without compromising my own standards. I discovered just how important it is to organize my time, priorities, and studio space. I really need some downtime to be productive and creative. I don't have kids but I do have a mate and a dear dog that I like to spend time with. I don't expect my house to be white glove clean but I do need some sense of order and cleanliness. Also, I cook whole foods from scratch, which takes time but health is worth every minute. I love being productive. It gives me satisfaction and a sense of accomplishment. I love what I do. I don't want to do anything else. There is so much room for growth! The wave studies continue! I am at 32 with a goal of 100. Drawing, drawing, drawing. I have always drawn. I am a huge advocate of learning to draw and maintaining a drawing practice. The last point is getting critical. If I am going to continue to do what I do, I need an income. It is a fact of life. I may have to supplement with a part-time job for a time but I am hoping it doesn't come down to that as another job would take away time from my real work and career. Fortunately for me, there are artists out there who are able to support themselves. They work their rear-ends off doing what they love. I watch and learn a lot from them so I don't have to reinvent the wheel. I cannot begin to express how grateful I am for these mentors. That is it for today! I am going to spend the morning cleaning and organizing my studio. This afternoon I need to head north to replenish my poor bare pantry. 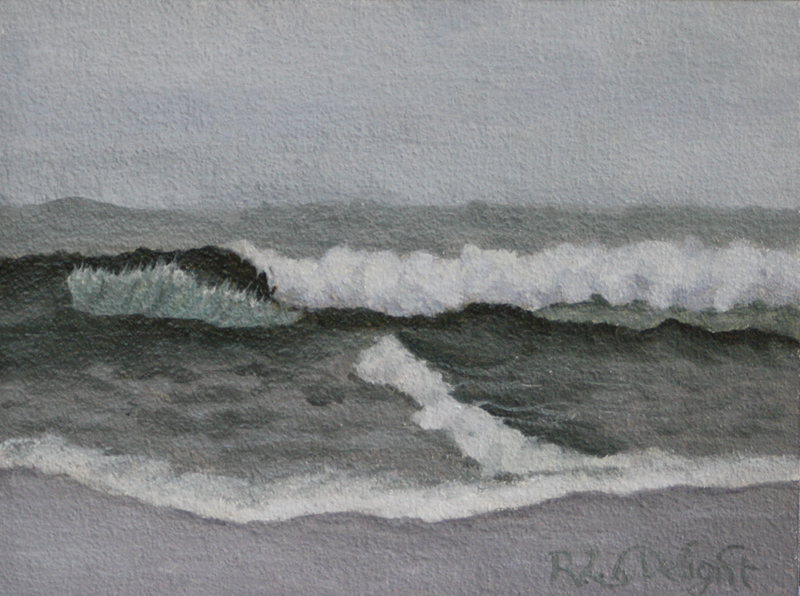 If I have time, I am planning to stop off at one of my favorite spots and do a bit of wave sketching. Tomorrow it will be back to the beach and studio! Thank you all for the wonderful comments you have left and thanks to those who stopped by for a peek! I felt like I had a cheering section. Hooray! Sending you a big pat on the back for completing this hard challenge. It's easy to be a cheerleader when the work is so lovely. And looking forward to seeing all the future work too.